The Pocantico Water Treatment System, originally comprised of four lakes, a pumping station, and a water distribution system, with a filter plant added in 1952 to improve the water quality. It currently serves the nearby estates and residential district. To bring the treated water in compliance with the drinking water regulations, CAMCE was retained by the Town to upgrade the facility. The modifications included installation of two 0.5 MGD package upflow clarification/rapid gravity filtration units, chemical conditioning systems, and a new vertical turbine type pumping station, sized to be retrofitted into the existing building. In conjunction with the plant modifications, the water source/collection system was modified to include a raw water transfer pumping station to the four lakes, valve chambers, intake structures, construction of overflow spillway, replacement of sluice gates and raising of the height of the existing dam. The plant is operated by means of a SCADA system located within the offices and laboratory, and can be remotely operated from an offsite location of the Town's operating facility. As part of the upgrade and improvement to the existing water distribution system, CAMCE has provided the engineering services to the Village of Ossining for cleaning and cement mortar lining of aged cast iron water mains. 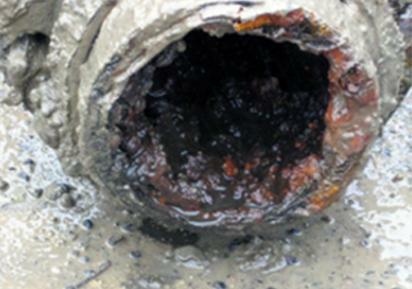 The phased work entails cleaning of cast iron water mains and placing an approximately 3/16 inch thick cement mortar lining in the cleaned pipes, replacement of 6 and 8 inch diameter water mains, replacement of curb stops and curb boxes, installing/replacing the existing fire hydrants and gate valves, and valves on the water main. All lead service connections between water main and curb stop are replaced with one inch diameter copper pipes. 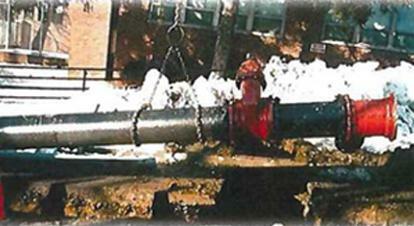 A temporary water bypass piping provides potable water and fire protection to the consumers being isolated. A total of approximately 33,000 linear ft. of 6 and 8-inch dia. cast iron water mains have been cleaned and cement mortar lined and 1,200 linear ft of cast iron pipes replaced with 6-inch dia. Class 53 D.I. Pipes. The next phase involves replacement of approximately 8,000 linear ft. of 6-inch diameter cast iron pipes with 8 and 12-inch dia. Class 53 D.I. pipes. 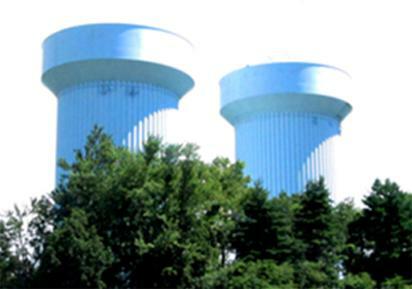 In order to comply with the Surface Water Treatment Rule issued by the New York State Department of Health and to bring the water system into compliance with the water quality regulations, the Town of Mount Pleasant opted to construct a new pumping station, transmission mains and elevated water storage tanks. The major component of the project is the elevated water storage tanks, which provide contact time for disinfection. CAMCE used a customized computer program to simulate all the varying parameters which can affect the required contact time such as pH, temperature, chlorine residuals, diurnal and seasonal flow variations, future demand needs, and fire flow, which supported construction of twin 2 million gallon water storage tanks. Thus the tank sizing was optimized to minimize the expense. CAMCE selected and designed hydropillar style tanks (fluted column), in part because of the need for storage space and to house the water department's working facilities. In conjunction with the design of twin 2-million gallon water storage tanks and an interconnecting transmission main required to achieve compliance with the Surface Water Treatment Rule, the Commerce Street Pump Station was the key component needed to deliver water from the source, the Catskill Aqueduct, to the new water storage tanks. CAMCE designed the pump station, which houses three constant speed centrifugal pumps, sized to transport 8.0 MGD of water from the source to the new storage tanks. 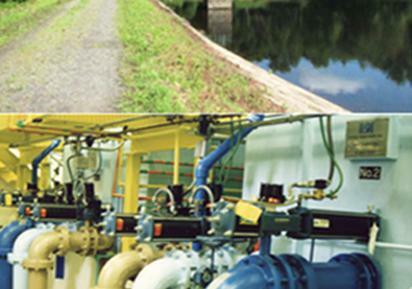 Numerous in-house customized programs were utilized in the design including a water quality program to determine the required chlorine dosage for CXT compliance; a program simulating present and future design flows, seasonal/diurnal variations and fluctuating supply source levels to analyze the hydraulics; and a program which performed dynamic simulations of tank levels at one minute intervals to create an efficient control sequence for the pumps. The pump selection was based upon optimum pumping efficiency to deliver the high head levels required, thus reducing the operating costs. The pump station also housed a 1,500 kW emergency generator as a secondary power source, housed in a room lined with acoustical blocks designed to attenuate noise from the equipment to decibel levels permitted under the Town codes. The transmission main is cement mortar lined Class 56 ductile iron pipe, rated for 350 psi working pressure. As the transmission main’s route has several dips and vertical bends, the pipe was provided with combination air release valve assemblies for both air and vacuum relief during the filling. The transmission main is nearly 10,000 feet in length, with over 8,600 feet of the main installed in Commerce Street and Stevens Avenue. Installation of the main entailed excavation of rock in environmentally sensitive areas adjacent to drainage tributaries to the Kensico Reservoir. CAMCE resident engineer enabled the project to successfully cross two environmentally sensitive streams with the water main with no negative environmental impact to downstream water quality or protected flora and fauna. The transmission main and ancillary piping was completed in the contract allotted time frame with minimal disturbance to the surrounding residences. County Water District 3 retained the services of CAMCE to evaluate their existing water system. 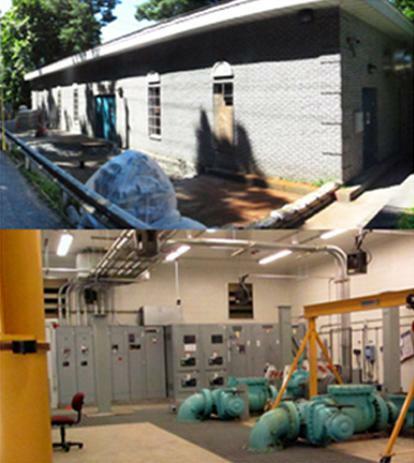 The Booster Pump Station was constructed at the Hospital site to alleviate the low pressure problems experienced, and the existing Greenburgh Booster Pump Station was decommissioned. Additionally, the Gates of Heaven Pump Station were upgraded. In order to improve the carrying capacity of the pipe, the county undertook cleaning and cement mortar lining of water mains by removing the tuberculation caused by corrosion. In addition, to improve the distribution system capacity new water mains were installed.